This is the thread wherein we discuss everything about the Colonial Marine 'Raider'. Some of you already know what this is, while others don't. There isn't much to know, of course, and so the need for this thread. I'm in a rambling mood, so I apologize in advance for rambling. Years ago I was invited by several attendees and event planners to run 'Aliens' scenarios at Dundracon, a fantastic table top role playing convention out of San Ramon, California. The requests were so gracious that I decided to jump in and really make the games good, and by good, I mean 'full of props', screaming, gunfire, props, xenomorphs and more props. To that end I created the 'Colonial Marine Raider', just to add a little something to the fandom. Now, I did this for two reasons. First, it allowed me to make something all new and interesting and put a pin in the fandom. Second, I always loved the idea of the original Marine Raiders, so it allowed me to pay tribute to them. Coincidently, I also paid tribute to real life, killed in action heroes, by naming all the characters in the game campaign after soldiers from Utah that had died in service going all the way back to WWII. Also, I got to make cool patches. This isn't to say that it hasn't appeared on uniforms. Some Colonial Marines from all over have worn them on armor and uniforms for costly, fan films and the like, so if we base it solely on those, there is some precedent, but I thought we might go just a little further and open it up to discussion here. Now, I'm not trying to shoehorn in a whole new branch of the Colonial Marines where it might not fit. It's just a fun little idea that I'd like to see added as a footnote in the greater fandom. A little faction of a greater whole, just like the original Marine Raiders. And since some of you might be reading about this for the first time, I'll post some minor details from the stuff I created for the convention years back. 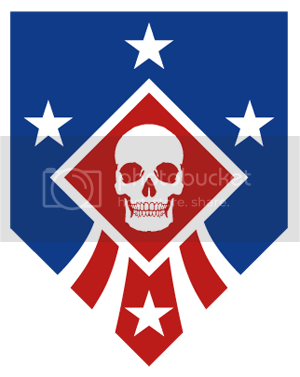 In the campaign made for the convention, I borrowed from the regional 'Marine Raider' ideology of 'elite units' established for special 'amphibious light infantry warfare'. Think 'drop units for special operations in harsh, isolated climate areas such as jungles, islands of heavy vegetation, swamp regions, flood plains, etc.' While not strictly amphibious, these special operation units would serve as combat infantry in primarily wet, heavily vegetated climates. The original campaign was on a very hot and humid planet with large primordial jungle regions. A science facility, built by Weyland-Yutani in conjunction with the military, shared the common use of power plants, water supplies, food, security areas, etc. The Military forces of that narrative were not made aware that WY had smuggled in samples of Alien materials and at least two partially damaged eggs to the shared facility. The science and military complex there housed, nearly 200 permanent personnel, over 300 different live, local species and countless samples of fauna, so it was ripe for exploitation by a xenomorph, should it escape the lab confines. Of course, it had. I'd not written much more about the Raiders in the form of history, but used them simply as a specialized force. As I've stated elsewhere, "I haven't fleshed out all of the EU history surrounding it, but it's growing slow and steady. I've purposely kept it small and relatively ambiguous, so it can evolve well." That said, and without adding any more history at the moment, I though we might tackle the uniform question first. Should this be so specialized that it would replace any of the traditional patches of the Colonial Marine, or should it be an added patch on the uniforms as they are now? Also, I was totally flattered (when searching topics tonight) to learn that some of you have asked that your titles be changed to 'Marine Raider'. I didn't know that. Cheered me right up after a very long day at work. Last edited by Yellowjacket on Mon Nov 28, 2016 12:37 am, edited 1 time in total. Outstanding!!! Very, very well thought out! I remember the old Dundracon at San Ramon, held at the Dunfrey Hotel, wasn't it? We probably crossed paths back then, wish I'd known of this, sounds like it was a outstanding time!! 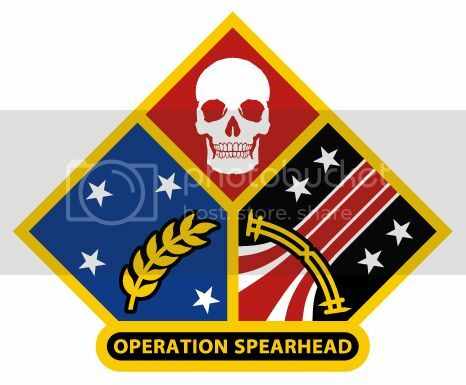 I'd like to add the Marine Raider, and USS Utah insignia to my Global Forces gallery. It was insane. Instead of using the traditional dropship, we utilized the earlier concept and the 'Razorback' design we made from Ron Cobbs' sketches and they used it the way it was meant to be used. They took the fight to the aliens and made some amazing tactical decisions on the fly. Just an all around great team of players. I'd play with that group again anytime. I was hoping on high-res images if possible. I have seen at least one Raider (Burner perhaps?) wear the patch on the shoulder tab of the armour. I dig it because it remains visible even when you're fully geared up (unlike the ship patch/Delta) and it doesn't replace an existing patch. What do other folks think of this placement? Yeah, I liked that placement for the same reasons. None received. Must be a system issue. I have on the tab. Burner has them on his BDU's. Looks cool to me, I'm going to do that too. Just drop me a private message with your email, and I'll send them over. I'll be making some Marine Raider 'paperwork' very soon. I've always wanted to expand on the theme and make more props for the Raiders. The term "Marine Recon" conjures images of daring raids and desperate rescue missions in enemy territory. The reality, though less glamorous, still encourages the Colonial Marines' finest to sign up for recon, the most demanding and challenging mission within the corps. Reconnaissance Marines train for "special operations", a term covering many missions, including deep penetration reconnaissance, raids anddemolitions, assassination, the training of partizans and guerrillas, and rescue operations. Recon Marines have to operate in all enviroments and a given extensive training in underwater, deep space and hostile planetary environments. Usually operating in autonomous four-man teams, the Recon Marine's job is to stay hidden in the heart of enemy territory, supplying the kind of vital intelegence that satellites or aerospace craft cannot - information that can only be uncovered by an expert man or woman on the ground. Because the Recon mission is so flexible, Recon Marines in the field frequently have to perform special tasks - such as demolitions or raids - at short notice, and often with no more equipment than the already carry. There are many techniques for covertly inserting Recon Marines into an operating zone. Because there are flew places inaccessible from space, the most popular method is an orbital drop, either by aerospace shuttle, or by a dead-drop re-entry vehicle. The dead-drop method is the stealthiest approch, but also the most risky; it involves placing a single Marine inside a small capsule which makes a ballistic re-entry. At low altitude, a drogue shoot slows the capsule, allowing the marine to eject from it and unfold a parafoil, beneath which they can glide to the landing zone. Where Colonial Marines already own the landing sites on a planet, more conventional methods of insertion are used - by aerospace craft, boat or submarine. I do like this, would it not replace the screaming eagle? Last edited by SGM Baldwin on Fri Nov 25, 2016 4:34 pm, edited 1 time in total. Yes, this is a good example of special operations. The Marine Raider would be similar. I've been working on a write-up that includes these sorts of details, along with the idea of an amphibious version of the APC that would be dropped by a standard, or oversized dropship. It could, but I'm not certain I like the idea of 'replacing' any strong aspect of the canon dress code. I prefer the idea of expansion and addition over replacement. By the early 22nd century, the spread and expanse of human exploration had reached such a degree that the Colonial Marine Corps was seeing deployment to all corners of the Network and there was an ever increasing need for specialization. While the standard model for deployment, supply and maintenance of Colonial Marines worked well in most environments, the USCM began creating 'special operation forces' to serve as elite units within the Corps. These units would receive training specific to the environmental demands in which they would serve. In the latter part of 2138 it was decided to create amphibious battalions within the USCM for marked deployment to areas where water played a primary factor in logistics. An ever-growing variety in terraforming and planet discovery had given rise to colonization near tropical wetlands, swamps, and jungle regions. These locations wreaked havoc on standard equipment and materials designed for early terraformed worlds where flora was sparse or nonexistent, and water was valued at a premium. Standard vehicles and vessels of the USCM were now being challenged by the lush, heavy vegetation and surface conditions of some colonies. In many cases, the cost of maintenance and re-supply exceeded budget and planning. 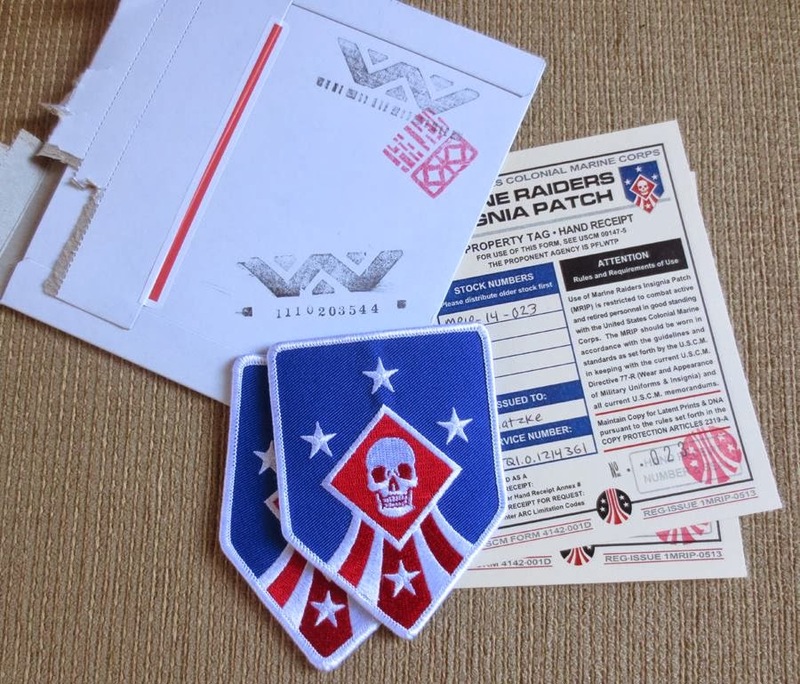 By early 2140, the USCM had scheduled the formation of what would become the Marine Raiders, in tribute to the earlier Raiders of the same name and similar purpose. It was decided to formally activate this new branch in February of 2142; again, in tribute to the original forces 200 years prior. As added homage, they began construction of the first two Marine Raider vessels, the U.S.S Carlson and the U.S.S Edson, named for Brigadier General Evans Fordyce Carlson and Major General Merritt Austin Edson respectively. Many military bases in use near wetlands, swamps and coastal areas soon saw the training of the first Marine Raiders and research and development groups within and without the USCM were now redirected to create weapons, equipment and technologies to combat such enemies as rot, mildew, rust, submersion, etc. By mid 2141, the excitement within the USCM and civilian interest had grown, so that the concept of the Marine Raider was well accepted well before the inauguration of these special forces. Indeed, the lucrative contracts for specialized technologies garnered strong support in the private sector, and whole new companies and industries were born on the back of the Marine Raiders directive. Within months of activation, technologies slated for combat service alone, were soon modified for other harsh environments, and materials created solely for the Marine Raiders soon saw service in the greater terraforming industry. On the 16th of February, 2142, the Colonial Marine Raiders were officially activated and deployed. harsh climate conditions that are wet so Minnesota in the winter. i love the idea and will keep watching the raiders. This was one of the updates weapons I designed for the Colonial Marine Raiders for the RPG project. Something like a subcompact Pulse weapon and grenade launcher. Very Vector-esque, and similar to the SMG from A:CM. I dig it. Definitely looks more high-tech than other marine gear though. Following Bacta Baby's lead, I have added the patch to my shoulder tab. I soaked it in coffee first to weather it a bit too! This is all kinds of greatness! Awesome Raider comrades for life! And speaking of additions, I'm considering some follow up patches like this one.